UDAYA provides a comprehensive picture of adolescents’ education. It examines: educational attainment, school attendance among adolescents, the quality of educational institutions, schooling experiences, educational aspirations, awareness and outreach of school entitlements and literacy and numeracy skills. UDAYA also explores the economic activity of adolescents, including employment-seeking practices, vocational skills training, awareness of government programmes and participation in household-related work. 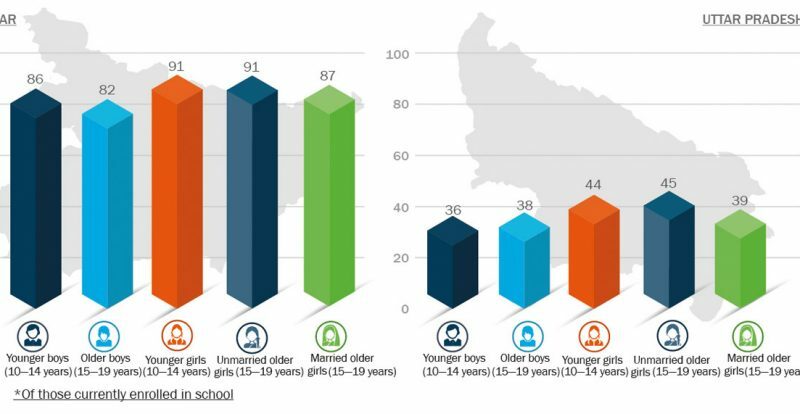 Only three of every five boys and unmarried adolescent girls aged 18–19 had completed up to Grade 10 of schooling. 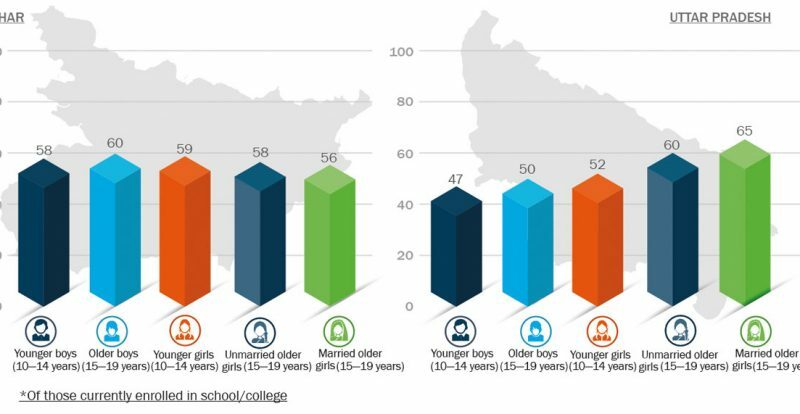 Two in every three boys and one in every two unmarried girls aged 15–19 wanted to work for pay or acquire a vocational skill. The Government of India has invested in improving education through two key programs, the Sarva Shiksha Abhiyan (SSA) established in 2001 for elementary education (Class 1–8) and the Rashtriya Madhyamik Shiksha Abhiyan (RMSA) initiated in 2009 for universal access to, and retention in, secondary education. 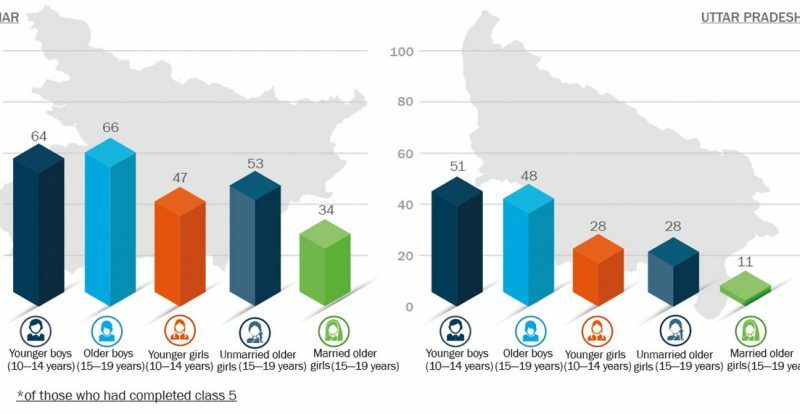 UDAYA data indicated high levels of enrolment amongst younger adolescents, with limited gender disparity. 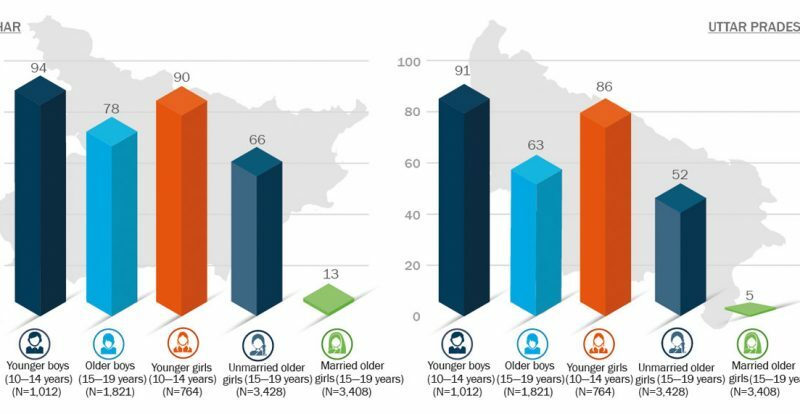 However, retention beyond primary school was low: unmarried girls and boys typically only stayed in school for 9 years, and married girls for 7–8 years. Learning outcomes, in terms of both literacy and numeracy, were poor amongst adolescents. 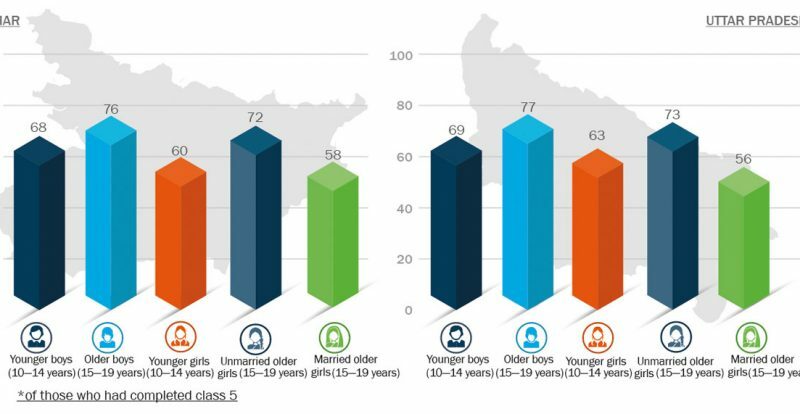 Only three-quarters of boys and unmarried girls aged 15–19 years, who had completed Classes 5 and above, were able to read a Class 2 text fluently in Hindi. Between one-half and two-thirds of boys and between one-quarter and one-half of unmarried girls aged 15–19 who had completed Classes 5 and above were able to solve a simple division problem. Although the gender gap had narrowed or disappeared on many indicators of education—enrolment in school, completion of education, and regular attendance—learning outcomes remained inequitable. UDAYA found that access to and control over financial resources were limited among adolescent boys and girls, with noticeable gender differences regarding the operation of savings accounts. 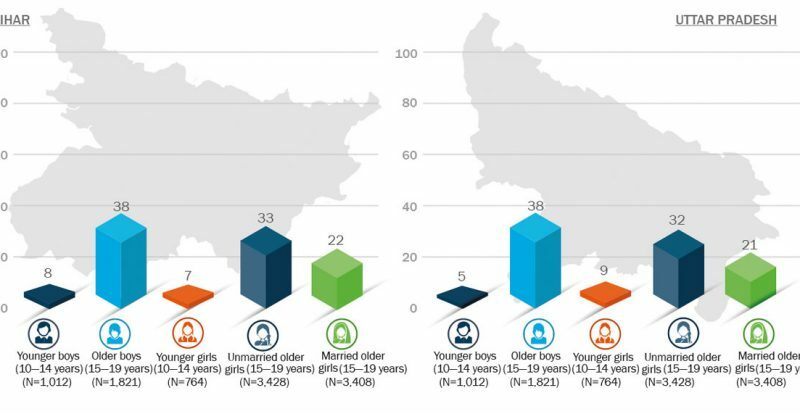 In Uttar Pradesh, more than four in every five boys aged 15–19 who owned an account reported operating it themselves, compared to a little over two out of three unmarried girls aged 15–19. 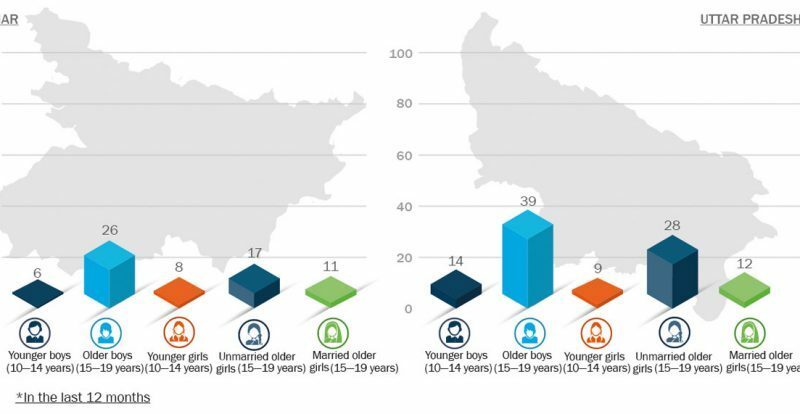 In Bihar, nearly three of every four boys and two out of three girls aged 15–19 who owned an account, operated it independently. Married adolescent girls aged 15–19 had relatively less access to savings accounts compared to unmarried adolescent boys and girls. While only one-third of married adolescent girls owned a savings account, nearly half of unmarried girls aged 15–19 had a savings account. Married adolescent girls also had relatively limited control over their bank accounts when compared to their unmarried counterparts. 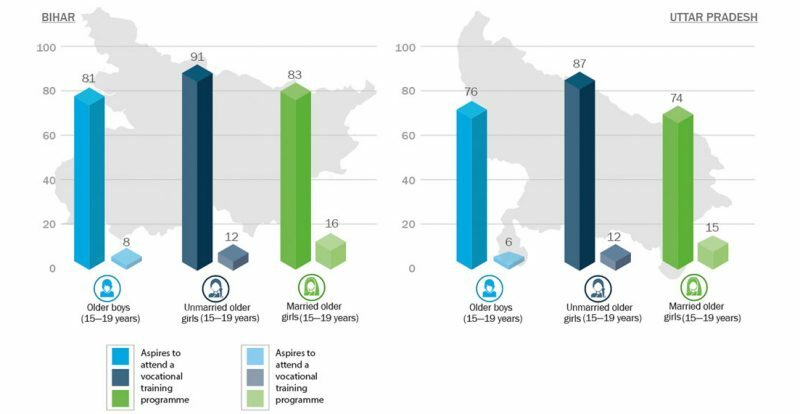 While the large majority of adolescents expressed interest in obtaining vocational training, just 6–16 percent of adolescents had ever received such training. Adolescents’ preference for vocational skills were gendered. Boys preferred to learn skills as a computer operator, automobile mechanic, and electrician, while girls were interested in training in tailoring, computers, and handicrafts. 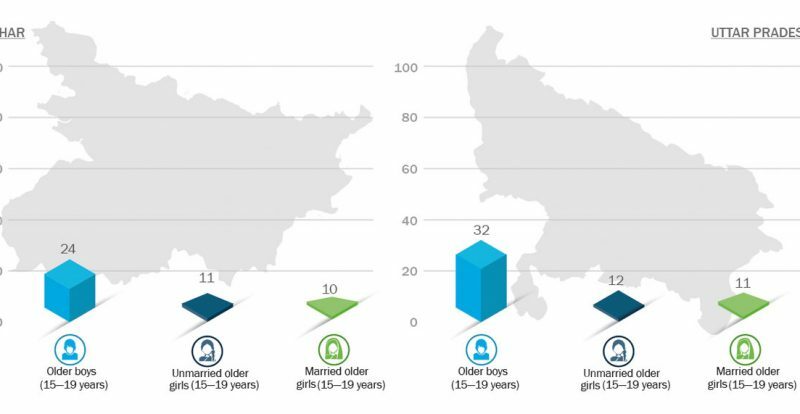 One in four (26 percent) of older adolescent boys in Bihar and two in five in Uttar Pradesh were engaged in some type of paid work in the last 12 months. 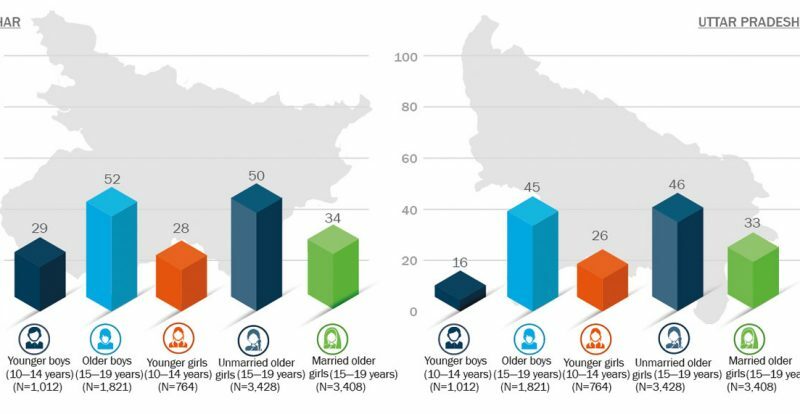 About one in four older adolescent boys in Bihar and one in three adolescent boys in Uttar Pradesh were seeking jobs.